The Appeals Chamber set out principles and procedures for reparations, amending an initial reparations order in the Court’s landmark first trial. The Trust Fund for Victims, established under the ICC Rome Statute, now has six months to present a plan to trial judges to implement the decision. Lubanga is serving out a 14 year sentence for the war crimes of enlisting and conscripting children under the age of 15 and using them to participate actively in hostilities. The ICC is the first international tribunal to provide for reparations to victims, a key feature of the Rome Statute system of global justice. The ruling was widely welcomed by civil society. REDRESS noted that it demonstrates that the amount of money the convicted person has should not determine the reparations owed to victims. The International Federation for Human Rights (FIDH) and its Congolese member organizations commended the Chamber for its comprehensive, consultative, culturally-appropriate and gender-sensitive approach to reparations. Before the ruling, FIDH had called on the judges to ensure that both directly and indirectly affected victims are compensated beyond monetary means. The American NGO Coalition for the ICC (AMICC) praised the Appeals Chamber’s ruling for providing important guidance for future decisions on reparations. Women’s Initiatives for Gender Justice said the ruling failed to adequately recognise the harm suffered by victims of sexual and gender-based crimes, noting that while the decision held that Lubanga could not be held liable for reparations for sexual and gender-based crimes, a gender-inclusive approach to reparations should be taken. Physicians for Human Rights’ Widney Brown similarly criticized the reparations decision for excluding victims of sexual and gender-based violence. Academic Luke Moffet argued that the specificity of ICC reparations judgments might not satisfy all victims. Summary from the Open Society Justice Initiative. 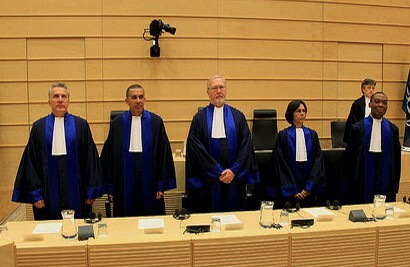 Six new ICC judges will be sworn-in at a ceremony in The Hague next week. Elected last December, the new judges will play a central role in shaping international justice over the next decade. So who are they? ICC Prosecutor Fatou Bensouda said that justice for victims of the CAR conflict could only be achieved by taking legal action against perpetrators from the Anti-balaka militia and Seleka rebels. DNA tests confirmed that the body of missing ICC witness Meshack Yebei was found. Yebei’s family accused both Kenyan Deputy President William Ruto and the ICC of not doing enough to help solve his disappearance. In a Daily Nation op-ed, theInternational Center for Policy and Conflict’s Ndung’u Wainaina argued that effective witness protection is necessary to successfully fight crimes in Kenya. Kenyans for Peace with Truth and Justice published a report on the Kenyan government’s lack of cooperation with the ICC, and Amnesty International criticized the Kenyan government for attempting to undermine the Court. The ICC Appeals Chamber confirmed the decision to issue an arrest warrant for Darfuri rebel leader Abdallah Banda. The African Commission on Human and Peoples’ Rights issued a decision holding Sudan responsible for the detention and torture of three Sudanese human rights defenders who had allegedly supported ICC investigations in the Darfur region. UNAMID whistleblower Aicha Elbasri urged ICC Prosecutor Fatou Bensouda to re-open investigations in Darfur. A new report from the UN revealed that nearly half a million people were displaced in Darfur last year, the highest number in a decade. UNAMID will cut 770 civilian jobs amid pressure from Khartoum to withdraw from the region. Avocats Sans Frontières expressed regret at ICC judges’ decision to uphold Mathieu Ngudjolo Chui’s acquittal, while the AMICC said that the decision demonstrated the Court’sprofessionalism. After the ruling, the ICC prosecutor stressed that the decisiondoes not negate the fact that crimes were committed or that victims suffered. Ngudjolo’s lawyers filed a petition with the European Court of Human Rights in order to stop Dutch authorities from sending him back to the DRC, where they say his life would be in danger. ICC Prosecutor Fatou Bensouda met with Parliamentarians for Global Justice’s national group in the Ugandan parliament. Bensouda said that the ICC would guarantee protection for all witnesses in the proceedings against Dominic Ongwen, and that she will expand the charges against him. Victims of the Lord’s Resistance Army (LRA) expressed their willingness to forgive Ongwen as part of Uganda’s traditions and culture.The prosecutor’s visit to Uganda prompted calls for investigations of alleged government crimes from legislators and victims of the LRA conflict. Ugandan President Yoweri Museveni pledged to cooperate with the ICC on the Ongwen case. An IRIN columnist argued that Museveni’s cooperation with the ICC is opportunistic. Bensouda called on LRA rebel chief Joseph Kony to surrender. No Peace Without Justice (NPWJ) is organizing a workshop on documenting human rights violations for Libyan civil society. The UN will resume talks with Libya’s warring militias later this week. While the Malian government signed a peace deal with other northern armed groups, the main Tuareg rebel alliance asked for more time in order to secure support for the agreement. The UN welcomed progress in Mali’s peace talks. The AU also welcomedthe agreement, and the EUcalled for parties that had not yet signed to do so as soon as possible. During its eight quarterly conference, the Ivorian Coalition for the ICC (CI-CPI)announced that African states have regressed in their fight against impunity (in French). Ali Ouattara, president of the CI-CPI, welcomed Ivorian authorities’ use of national instruments to fight against impunity, but called for the government to transfer Simone Gbagbo to The Hague (in French). The CI-CPI also called for the implementation of the Rome Statute in African states during the conference (in French). Ivorian prosecutors asked that Simone Gbagbo be sentenced to ten years in prison for undermining state security. Human Rights Watch (HRW) called on Afghanistan to hold officials and commandersaccountable for alleged atrocities. The OTP concluded a mission to Colombia. The FARC said that it will not sign any peace deal that allows its members to be tried and imprisoned, a position rejected by HRW and the Colombian government, among others. The Peoples Democratic Party in Nigeria called on the ICC to bring General Muhammadu Buhari to trial for thealleged post-election violence in 2011. Presidential candidate Goodluck Jonathan said that Buhari could not exonerate himself from allegations of human rights abuse. Boko Haram militantskilled about 100 people last week in attacks on villages in northeast Nigeria, and released a video showing the beheading of two alleged spies. UN Secretary General Ban Ki-moon againcondemned the Boko Haram attacks against civilian populations. Meanwhile, Chadian President Idriss Deby claimed to know the location of Boko Haram leader Abubakar Shekau and gave him an ultimatum to either surrender or be killed. Palestinian families see hope for justice in Palestine’s ICC membership, Inter Press Service reports. A senior official told AFP that the Palestinian Authority plans to lodge a complaint against Israel for alleged war crimes at the ICC on 1 April. The UN human rights chief called on Iraq to join the ICC after a report indicated that ISIS may be committing genocide in the country. An Open Democracy columnist called for Iraq to accede to the Rome Statute and accept the Court’s jurisdiction from the beginning of the conflict with ISIS. Foreign Minister Abul Hassan Mahmood Ali reiterated Bangladesh’s commitment topromote the universalization of the Rome Statute during a meeting with ICC Deputy Prosecutor James Stewart. The Coalition’s William Pace and Amielle Del Rosario explained how the upcoming election for an ICC judge gives Asia-Pacific governments an opportunity for greater representation at the Court. The Open Society Initiative’s Kelly Askin argued that the ICC and other international tribunals must ensure that sexual and gender-based crimes are effectively adjudicated. Citizens for Global Solutions discussed the ICC’s potential deterrent effect. In the International Center for Tranisitional Justice’s impunity debate, Michael Ignatieffargued that a ‘long view’ is necessary to sustain faith in progress, while Prince Zeidmaintained that state ownership of the fight against impunity, along with expanding the ICC’s jurisdiction, is key to success. NPWJ documented alleged crimes against Iraq’s minority groups and called for accountability. UNESCO chief Irina Bokova called on the ICC to look into the destruction of priceless artifacts by militants in Iraq. HRW called on Sri Lanka to address past and present human rights abuses and ensure accountability. The ICC prosecutor said that the Court is involved in Africa because it was invited, and that leaders will be held accountable if they commit grave crimes.